These six dual consoles deliver on versatility, comfort and performance. Open boats allow us to experience the sights, sounds and smells of being on the water up close and personal. The wind in your face. Salt air in your lungs. Water lapping the hull sides. Gulls chasing bait around the bay. Isn’t this what boating is all about? It gets even better when you enjoy these simple pleasures with friends and family, and open boats encourage socialization with their free-flowing layouts from bow to stern. 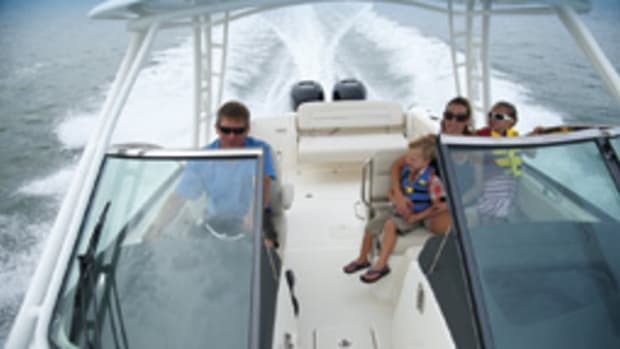 Open boats — dual consoles, runabouts, bowriders, center consoles — are more popular than ever because they fit the needs of today’s boaters. Dual consoles can have a closed bow and a full windshield like a runabout, or a split windshield with a walkway to a bow area with seating. Five of the six boats in our group have open bows and split windshield designs. 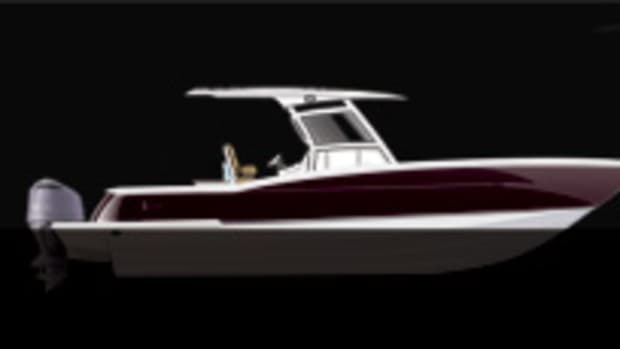 Only the Rossiter 23 has a closed bow — a key characteristic of its retro look. These builders pack their boats with comfortable, innovative seating that often doubles as convenient storage space. Gone are the days of hard plastic bench seats. Now you plop down on comfy, padded seats, some of which have pop-up backrests. There are transom seats that convert to sunpads. These boats also can morph into water-sports machines. Plus, for beach hopping, most have forward ladders for exiting the boat from the bow. An enclosed head is important on these boats, and the dual console typically houses a head in one of its consoles. Entertainment features loom large, too. Builders offer grills and refrigerators, even air conditioning. Some boats are large enough to hold a berth, sink and microwave. And don’t fret if you fish — anglers have not been forgotten. Cockpit seating often pivots out of the way to free up fishing real estate. 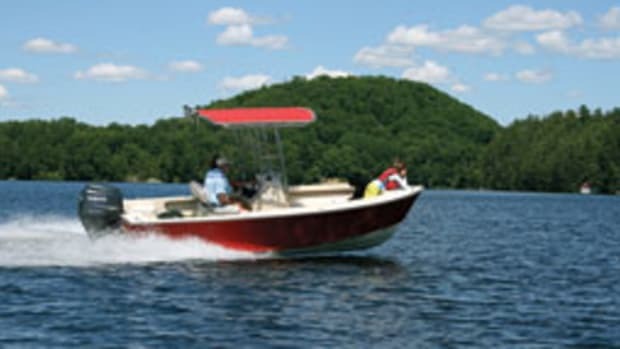 These boats come with insulated fishboxes, tackle storage and rod holders. Most offer a soft top or hardtop. Outboards power all of them, and the Grady-White takes three. No quads on dual consoles … yet. 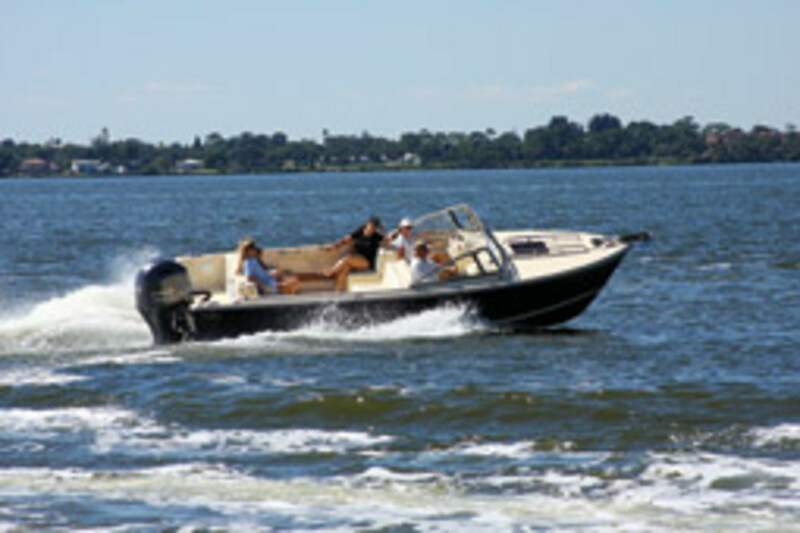 Outboard-powered open boats are typically more economical to operate. The Vanquish, for instance, with a single 250-hp Yamaha, gets nearly 4 mpg at 35 mph. The 23-foot Rossiter with a 200-hp 4-stroke gets almost 5 mpg. It’s no wonder the popularity of 4-strokes has skyrocketed. But it’s the multipurpose design of these boats that attracts boaters. 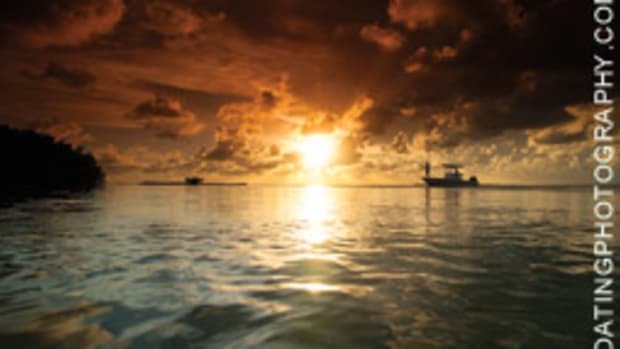 “People are using their boats differently these days, compared to just six years ago,” he says. Company owner Scott Hanson says his customers were looking for a “true dayboat, not a sportboat or boat purpose-built for water skiing or fishing, but rather a well-appointed, soft, dry-riding family dayboat.” So Hanson gave it to them with the Rossiter 23, which debuted this summer. It’s the Canadian builder’s biggest model in this lineup of traditional open boats. One of the goals with the 23 Classic was to deliver comfortable seating and space for conversation, says Hanson. “For a boat of this size, people are surprised at its spaciousness and comfortable seating,” he says. But the boat brings to the table much more than space and seating. It rides a variable-deadrise unsinkable hull powered by a single outboard. With Yamaha’s lighter-weight, 4-cylinder F200, the boat hits 43 mph at wide-open throttle carrying three adults and 70 gallons of fuel. At 20 mph, she gets about 5 mpg. “My recommendation for optimal power would be the 200 or 250 Yamaha or the Mercury Verado 225,” says Hanson. Hanson points out that the boat can be trailered without much fuss, too. It’s relatively light and skinny, with a beam of 8 feet, 6 inches. 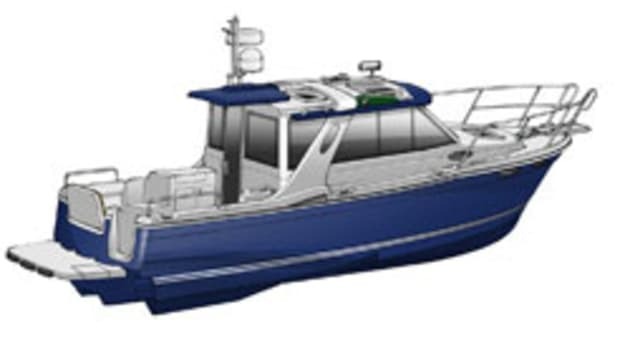 It’s a good fit for the “coastal and Great Lakes boater who wants a comfortable, stylish boat they can have fun in, yet will get them back to the dock if the weather turns,” says Hanson. 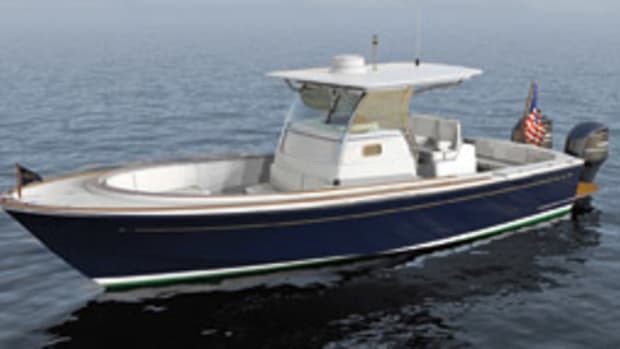 The Rossiter 23 Classic has a retro look, sporting a navy blue hull, a tall wraparound windshield with side vents and a closed bow with a cuddy. On the bow, a foredeck hatch sits between two stainless-steel rails, allowing easy access to lines and ground tackle. The starboard-side sit-down helm can seat two. A stern seat with a full backrest stretches across the cockpit with a lounge insert. The cuddy comes standard with a plumbed head (with a holding tank). Standard equipment includes a freshwater washdown, trim tabs and a swim ladder. Options include NuTeak synthetic teak decks, a pop-up ski pole, a removable cockpit table, GPS, Fusion stereo and a windlass. Zurn came through with an outboard-powered dual console that you might mistake for a custom one-off. 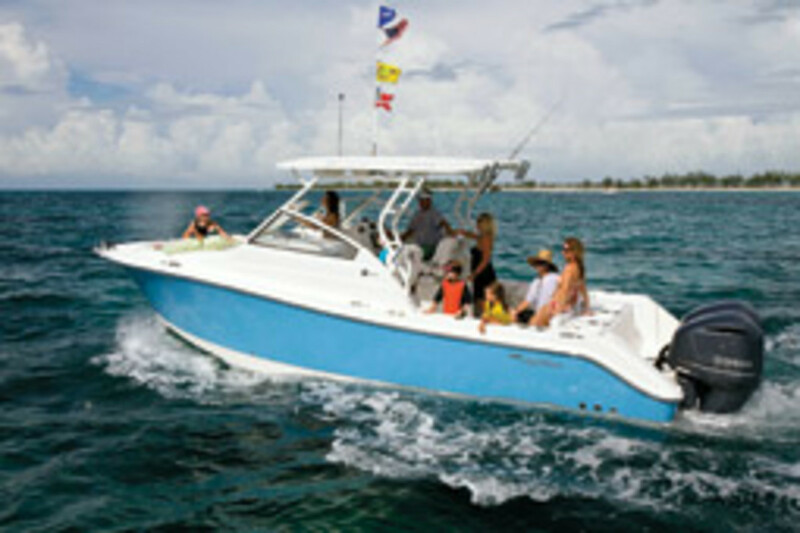 It excels as an open boat, with ample deck space for seating and storage and a versatile layout. 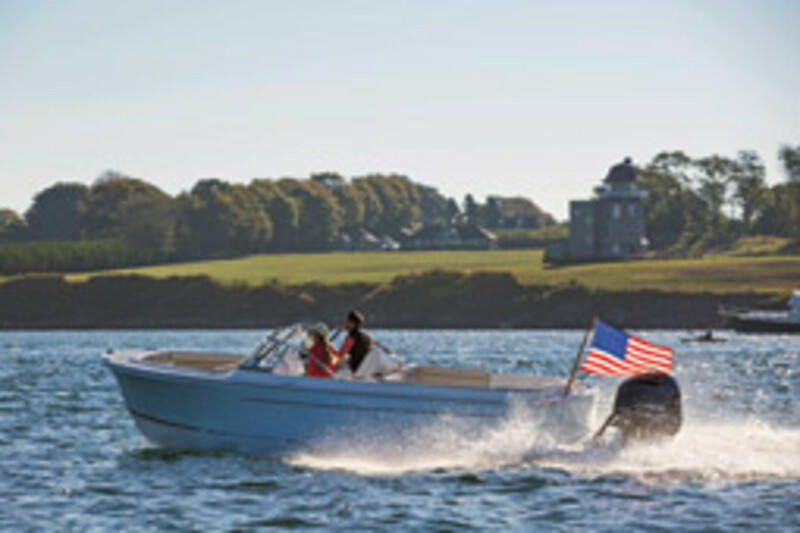 This 26 joins a fleet that includes an inboard 24-foot center console and runabout, and a 26-foot outboard center console. Huntley went with outboard power because an inboard’s engine box would gobble up valuable deck space. The boat is relatively light, too, with its carbon-fiber stringer grid and cored bottom, which is vacuum-bagged with vinylester resin. With a 250-hp Yamaha pushing her at 35 mph, the Vanquish gets nearly 4 mpg, with the engine burning about 9 gph. Wide open at more than 50 mph, she maintains a respectable mileage of nearly 2 mpg. An L-shaped settee extends down the port side, an integrated wet bar sits to starboard, and the port console houses the head. Isolated starting and house batteries, an Edson wheel, aluminum fuel tanks and silicone bronze through-hulls below the waterline (stainless steel above) are among the standard equipment. Grady says the boat has “ultimate transformer” features because of their dual uses. “Your fishbox one day can be your cooler holding your beverage of choice the next day,” says Tubaugh. You’ll find hideaway sliding seats and storage units throughout the boat, and there’s a foldaway table in the companion seating area and a galley/wet bar abaft the helm seat. Standard equipment includes a SureShade retractable sun shade. The bow contains wraparound seating, and twin pedestal tables can be quickly installed and removed. Half-moon tables cleverly match the curvature of the bow seating. The port-side air-conditioned console cabin holds two bunks (both 6 feet, 8 inches long), an entertainment center with a 19-inch flat-screen television and iOS-compatible stereo system, a plush bench seat, cedar-lined locker, mirror and storage. The starboard console holds a VacuFlush head, standup shower, sink, mirror, storage and microwave. The hardtop includes an overhead ventilation hatch that can hold fishing rods, as well as a flip-down flat-screen television in the port forward section. Talk about multitasking. Grady-White will mount twin Yamaha F350s, triple F300s or triple F350s, and Yamaha’s Helm Master system with joystick control is an option. With triple Yamaha F300s, the Freedom gets about 1 mpg at 30 mph. With triple F350s, the best mileage is just under 1 mpg at 32 mph. EdgeWater designed the 280CX “crossover” dual console to function as “one big dayboat that does it all,” says company president Peter Truslow. But he is quick to point out that the 280CX is no lake boat. “It is a real offshore boat that does well in rough conditions, plus it has the seating and head and features of a dual console,” he says. 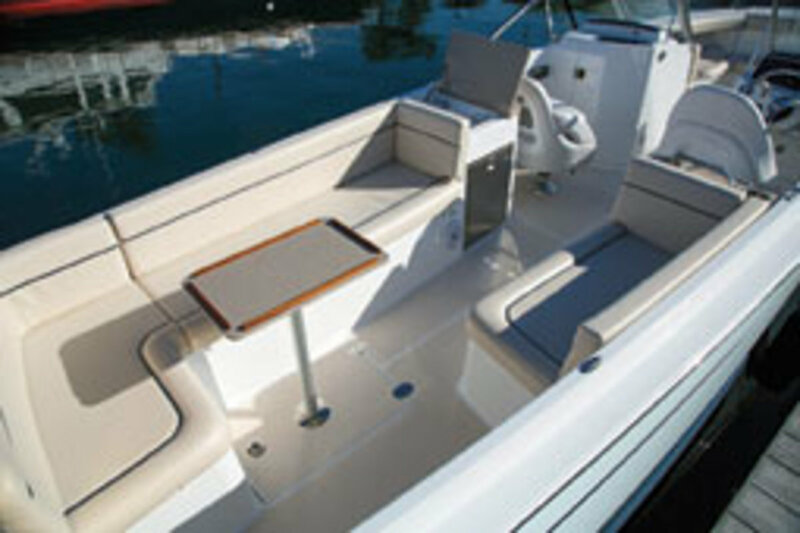 With its large console cabin, the boat can be used for overnighting. 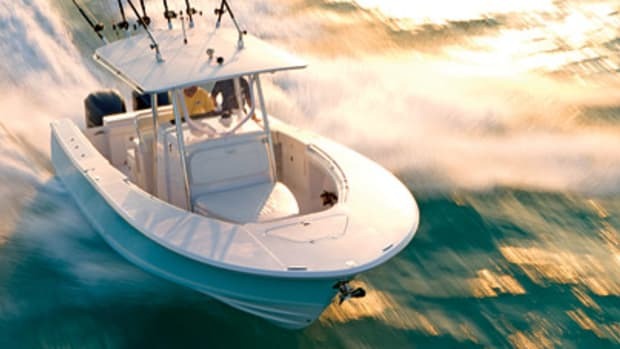 Its standard 28-gallon live well, 112-quart transom cooler with overboard drain and fishbox with pumpout under the cockpit sole also let it rise to the occasion when it’s time to fish. The 280 can certainly pack ’em in — and comfortably — with ample seating that includes a foldaway lounge in the cockpit, wraparound seating in the bow and “yacht-like” helm seating, says Truslow. She rides a deep-vee hull with 21 degrees of deadrise at the transom, which was used to build a center console version, says Truslow. 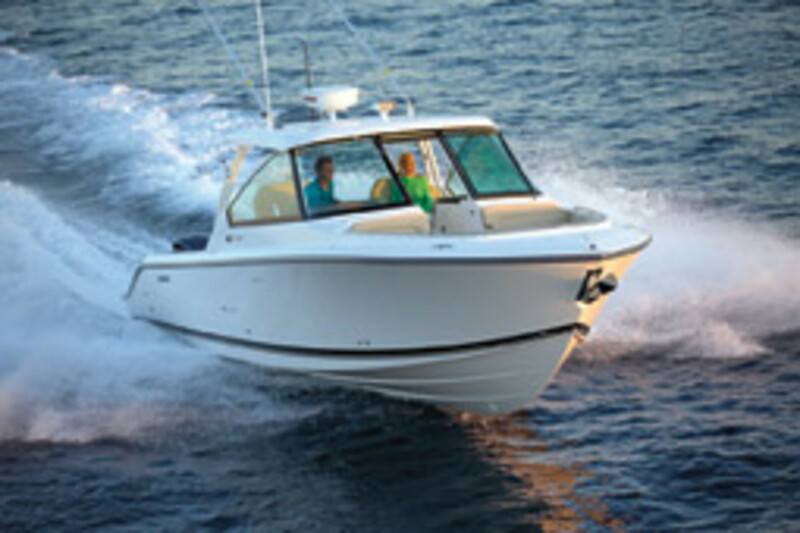 The 280CX is the largest dual-console in the EdgeWater fleet, which includes the 205CX and the 245CX. “A lot of customers were looking for a larger open boat, and the dual console has become increasingly popular,” says Truslow. 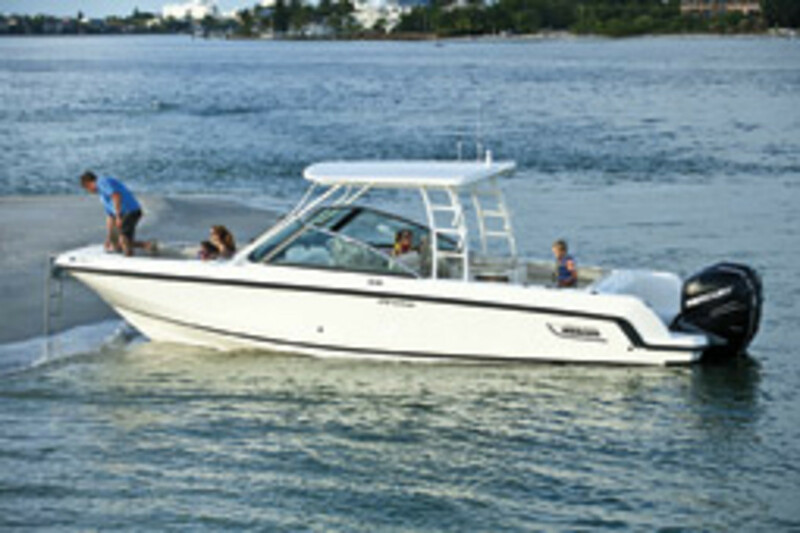 With twin Yamaha F300s, the best mileage comes in at about 30 mph, where the boat gets around 1.75 mpg. It can also be ordered with twin F250s for a slightly lower top speed but comparable mileage. The largest of three dual consoles that Pursuit builds, the DC 325 features wraparound bow seating, consoles for a head and a lounge/storage area, along with an entertainment center with an optional electric grill. “It has tremendous openness from the bow to the stern, and if you need to duck out of the sun or rain you have a full windshield that is integrated with the hardtop,” says David Glenn, marketing director for S2 Yachts, the parent company of Pursuit Boats. The easy-to-operate console doors stand out as an example of innovative design, in addition to the fully integrated hardtop and extended port and starboard transom wings, says Glenn. The head is in the starboard-side console and a berth that converts to a lounge seat and storage are in the port-side console. Rod racks are standard. Back up top, you have lots of seating options, including the L-shaped lounge opposite the double-wide helm seat and cockpit seating. 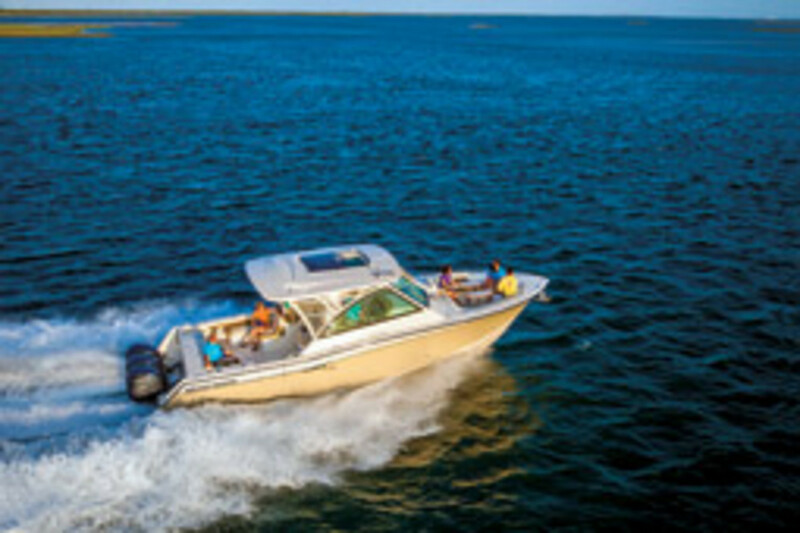 With twin Yamaha F300s, the boat tops out at more than 50 mph. “This is a big boat, but it’s zippy,” says Glenn. At 34 mph, the DC 325 gets 1.4 mpg, for a range of about 370 miles. The other dual consoles Pursuit offers are the DC 235 and 265. The companion seat design is just one example of the boat’s convenient and clever design, says Vaughn. It folds several ways so you can face fore or aft and be partially or fully reclined. Or it can be used as a leaning post. 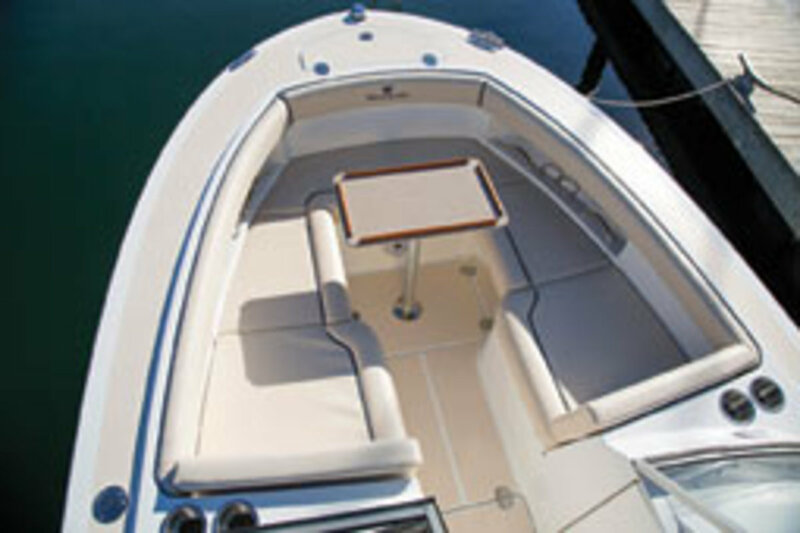 The 230 Vantage won a National Marine Manufacturers Association award largely because of its port-side seating configuration, and the 270 Vantage has the same seating. The transom seats on both the 270 and 230 Vantage stand out, too, Vaughn says. They are 4 to 5 inches deeper than the typical transom seat, and when unfolded, the backrest pops up. “It is truly sofa-like,” he says. 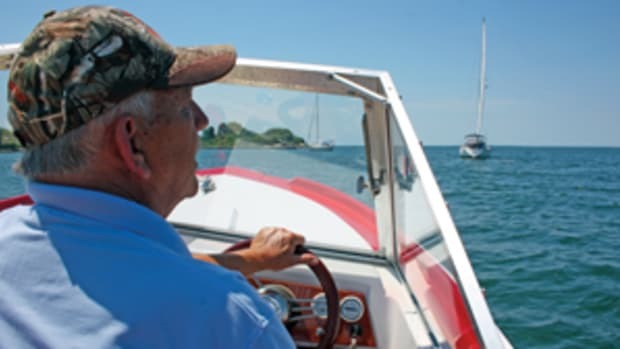 The windshield walkthrough is offset to starboard about 5 inches, making the helm console slightly smaller, though plenty big for the skipper, and the port-side head compartment larger, says Vaughn. The 270 can be ordered with one of two deluxe leaning posts — one with a live well and the other with storage space. The former comes with a 19-gallon live well, two rod holders, a freshwater sink, a cooler and raw-water washdown. Options include a windlass and hardtop. The boat was designed to also function well for water sports. You can get a water-sports tower with wakeboard racks and a tow bit, and you can store your gear or rods in the lockable ski/rod storage compartment under the deck. Mercury Verado 4-strokes power the Vantage 270. With twin 200-hp Verados, it gets 2.3 mpg at 29 mph. The boat can also be powered with twin 225s, and new for this year is the option of twin 300s. Performance data with the 300s was unavailable. A joystick piloting system can be installed on the 270 when used in conjunction with the 300s.